: Shepherd dog used in driving and guarding herds. : Mrs. Peggy Davis and Mrs. Ruth Binder-Gresly. : This ancient breed of guard dogs of herds has spread all over the region of the Italian Alps; the total number of these dogs was especially great in the Bergamasca valleys, where the breeding of sheep was highly developed. : The Bergamasco shepherd is a dog of medium size of rustic appearance with an abundant coat covering all parts of the body, of a powerful construction but very well proportioned. Its general shape is that of a medium proportions dog, whose body fits into a square. He is balanced as much in relation to its size (heterometry = normal proportions between size and different parts of the body) as with the profiles (alloidisme = concordance between the profiles of the head and the body). : The length of the body, measured from the foremost point of the shoulder (humeral-scapular joint) to the rearmost point of the thigh (pelvic tuber of the ischium) is equal to the height at the withers (the body thus fitting into a square). Permitted, but not desirable is a slight margin of tolerance which in no case must be more than one or two cms. The length of the head is 4/10 of the height at the withers. The depth of chest must be 50% of the height at the withers. 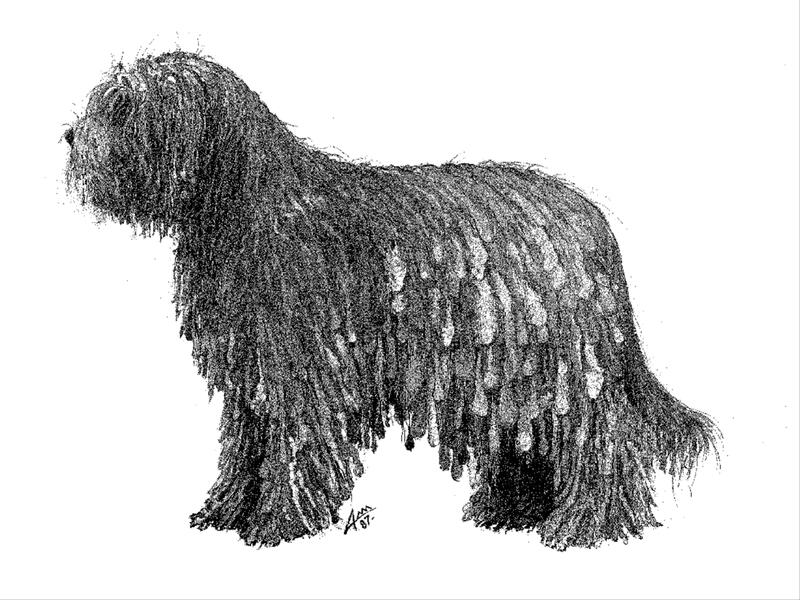 : The function of the Bergamasco Shepherd is to guide and guard the herd, task for which he shows exemplary disposition thanks to his vigilance, his concentration and psychological balance- His learning faculty and determination combined with his moderation and patience make of him an excellent guard and companion dog, suited to the most divers uses. He establishes a close relationship with man. : The length of muzzle is the same as that of the skull. In its parallelepiped ensemble, the head seems large. The skin must not be thick, but close fitting to the underlying tissues without forming wrinkles. : The skull is broad and slightly convex between the ears; is also wide and rounded in the region of the forehead. The upper longitudinal head planes of the skull and the muzzle are parallel. The length of the skull is the same as that of the muzzle. Its width must not be more than half the length of the head. The protuberances of the forehead are well developed both in longitudinal and transversal sense, the zygomatic process of the frontal bone are well defined. The median frontal furrow (or flute) is marked; the occipital protuberance is obvious and prominent. : The frontal-nasal depression (stop) is well adjusted, but accentuated due to the marked apophyses of the bones of the nose and forehead, the frontal protuberances and superciliary arches. : Tapers progressively towards its extremity and its lateral sides converge slightly, so that the muzzle itself is not pointed but truncated, with a foreface rather flat. Its length is the same of that of the skull. Its width, measured at half length, reaches about 50% of its length. The height of the muzzle must not be less than half its length. 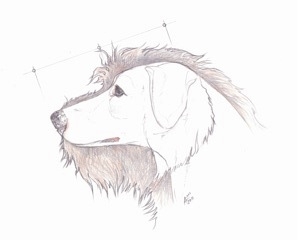 The upper profile of the muzzle, traced by the profile of the face, is straight. The lower profile is not determined by the lip, but by the jaw. Because of this conformation, the corner of the lips is not obvious; the mouth is well split so that the corner of the lips is at the level of an imaginary vertical from the outer angle of the eye. The lower profile of the jaw is almost straight. : Fine and of little importance, they separate under the nose making a well opened arc which forms a third of a circle; hence the teeth in the jaw are only just covered. The rims of the lips are well pigmented. : Upper and lower jaw well developed; the lower jaw (mandible) really strong and large. Teeth white, complete and well developed dentition; incisors in regular alignment. Scissor bite. : Large; iris of a more or less dark chestnut colour depending on the colour of the coat. They are set on an almost identical frontal plan. Their expression is soft, serene and attentive. The opening of the eyelid is slightly oval and the eyelid axis has an obliqueness of about 15° on the horizontal. The eyelids fit tightly over the eye, with black pigmented rims; eyelashes are particularly long so that they can lift the hair falling from the forehead over the eyes. : Set high, semi-drooping, i.e. the last two thirds of the lobe are drooping. When the dog is attentive, the ear lifts slightly at its base. Triangular shape. Length is between 11 and 13 cm, width 6.5 to 8 cm. It shows a wide base which, towards the back, extends to where the head sets on the neck, whereas towards the front, it reaches the middle of the skull. The tip is slightly rounded. On the ears the hair is slightly wavy and soft; ends up forming fringes on the tip. : Upper profile is slightly convex. The neck is a little bit shorter than the head; in effect, when extended, is not more than 80% of the length of the head. The perimeter of the neck, taken halfway of its length, must be at least double its length. The skin is never flabby, so always without dewlap. Hair must be dense. : Withers well defined from the straight topline. The lumbar region shows a certain convexity and the rump is somewhat sloping. : High and long. The neck harmoniously joined to the body. : Straight, well muscled and of good width, its length about 30% of the height at the withers. Lumbar region merging well with the topline and the rump. The length of the lumbar part is about 20% of the height at the withers; it is thus definitely shorter than the dorsal part. The width of the lumbar region is about the same as its length; muscles of the whole region are well developed. : Wide, strong, well muscled and slanting, with an inclination of 30° below the horizontal; transversal width between the hips must be 1/7th of the height at the withers. : Must be ample, brisket let down to the level of the elbows and well curved – Its perimeter (measured behind the elbows) is more by 25% than the height at the withers - Its transversal diameter must reach 30% of the height at the withers. Depth and height of the chest must be 50% of the height at the withers. : From the sternum, the lower profile rises very slightly towards the belly which is a little tucked up. The length of the flanks must correspond with that of the lumbar region, which is short. The hollowness in the flanks is minimal. : Set on third part of rump, thick and strong at its root, tapering towards its extremity. Covered with goat-like hair slightly wavy. Its length is 60 to 65% of the height at the withers and reaches the hock easily when the dog is standing normally; though it is preferable it should be shorter. At rest the tail is carried “sabre” fashion i.e. drooping in its first third parts, then slightly curved in its last third part. In action the dog wags his tail like a flag. : On the whole seen from the front and in profile the forequarters are straight. Height from ground to elbow is 50% of the height at the withers; they are well proportioned in relation to the size of the dog. : Well constructed and massive. The length of the shoulder blade is a little more than the quarter of the height at the withers and measures between 15 and 17 cm. Its obliqueness below the horizontal is of 45 of 55 degrees. Muscles must always be well developed. : Must be well muscled with strong bone construction. Its length is 30% of the height at the withers. Its inclination below the horizontal is between 60 and 70 degrees. The opening of the scapula-humerus angle varies between 105 and 125 degrees. : Must be placed in parallel plans to the median plane of the body. The point of the elbow must be on an imaginary vertical letdown from the caudal angle of the shoulder blade. The opening of the radial-humerus angle varies between about 150 and 155 degrees. From the level of the elbow going downwards, the hair must be abundant, long and dense, with a tendance to look like flocks of hair. : Vertical; its length is at least equal to that of the upper arm. Muscle and bone well developed. : Mobile and lean with the pisiform bone clearly protruding, it extends the vertical line of the forearm. : Must be lean and mobile. Seen from the front, must be placed in the same vertical plan as the forearm. Seen in profile , is slightly oblique to the front. : Oval shaped (hare foot) with well closed and arched toes. Strong nails, curved and well pigmented. Tough pads of a dark colour. : As the front with all the same characteristics. : On the whole, the hindquarters relate well to the size of the dog. Limbs straight, as much in profile as seen from behind. : Long, wide, well muscled with a rear profile slightly convex. Its length exceeds about 30% of the height at the withers, and its width 75% of its length. The aperture of the coxal-femoral joint angle varies between 100 and 105 degrees. : Is on perfectly straight line with the limb, is not turned either in or out. The tibial-femoral angle is open and measures about 130 – 135 degrees. : Robust bone structure and lean muscle, the groove in the muscle is well marked. Length of leg is about 1/3 of the height at the withers. Inclination below the horizontal is about 55 degrees. : Lateral sides of the hock joint must be really wide. The distance from the point of the hock to the ground must not be less than 25% of the height at the withers. Aperture of the angle of the tarsal-tibial articulation varies between 140 and 145 degrees. : Its length is about 15% of the height at the withers if gauged independently; if measured from the point of the heel bone, its length is the same as that of the hock. Its direction must be vertical. Eventual dewclaws must be eliminated. : Step free and long; the trot, rather extended and well maintained, is the preferred gait. Because of its conformation, the dog can easily go into an ordinary gallop, gait which he is able to maintain for a relatively long time. : Tight to the body, must be fine all over, but especially on the ears and forequarters. Neck without dewlap and head without wrinkles. Colour of the mucous membranes and third eyelids must be black. : Very abundant, very long and different depending on the regions. The texture is harsh, (goat hair) particularly on the front of the body. From halfway of the chest towards the rear, and on all the limbs, the coat tends to form strands or is already in strands, depending on the subject’s age; these strands must start from the topline of the back and fall on the sides of the body. On the head the hair is less harsh and covers the eyes. On the limbs, the coat must be evenly distributed everywhere in the shape of soft flocks falling towards the ground; forms a kind of pilaster on the front and strands on the hindquarters, this without fringes. The undercoat is so short and dense, it is not easy to see the skin. Must be greasy to the touch. : Solid grey or with grey patches of all possible shades from a most delicate grey to a brighter shade of grey on to black; Isabel and light fawn shades are permitted. An all black coat is allowed providing the black is really opaque (zain). An all white coat is proscribed – White patches are tolerated as long as their surface is not more than a fifth of the total surface of the coat. : The ideal height at the withers for males is 60 cm with a tolerance of 2 cm, either above or below. For the females 56 cm also with a tolerance of 2 cm more or less. Males 32 – 38 kg. Females 26 – 32 kg. Size over or under the margins indicated by the standard. Muzzle (foreface) definitely convex (roman nose) or concave. Total bilateral depigmentation of the eyelids. Jaws upper prognathism (undershot mouth). Taillessness (anury) or stump tail (brachyury); carried rolled over the back. Skin total depigmentation of the rims of the lips and of the eyes. Coat colour white, more than 1/5 of the total surface.